Peridot is the gem form of the mineral olivine and is called sometimes Chrysolite. 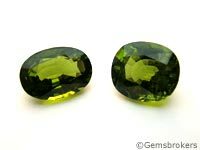 Small crystals of peridot are often found in the rocks created by volcanoes and can also be found in meteors that fall on earth. Peridot was called « Gem of the sun » by the ancients. They believed that it had the power to dissolve enchantments and to drive evil spirits away. For peridot to exert its full powers as a talisman, it had to be set in gold, and when worn in this way, it was thought to dispel the terrors of the night. When used as protection against the wiles of evil spirits, peridot was pierced and then strung on the hair of a donkey, and attached to the left arm. In powder, peridot was used as a remedy for asthma. When held under the tongue, it was believed to lessen the thirst in fever. Many beautiful examples of peridot were brought back from the Mediterranean area during the Crusades and used to decorate European cathedrals, where they still remain. Peridot, alternating with sardonyx, is the birthstone for August.